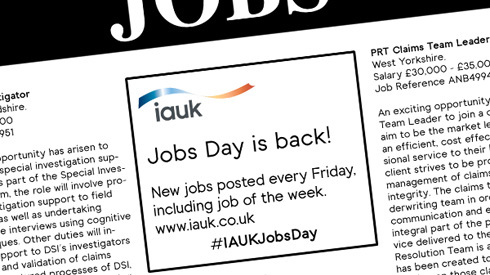 Welcome to IAUK, an insurance recruitment agency with a difference. Having been established since 1975 in Leeds we are one of the oldest, if not the oldest, specialist insurance recruitment agency in operation. The standards that were set then have been maintained ever since and we are widely recognised for the quality of service we provide for clients spread across the general insurance industry and loss adjusting profession. Whether you are an insurance broker, insurance company or loss adjusting practice you will find that the service we offer is unrivalled. The consultants we employ understand your needs and pride themselves on being able to find candidates that solve your problems. They are all qualified to give you the essential advice you need, and will work in partnership with you. We utilise a wide range of advertising media, but our main strength lies in our long-established database where the vast majority of candidates remain loyal using our service on an exclusive basis, because they trust the relationships they have built up with our long-standing consultant force. Most importantly, we undertake that once we have placed a candidate with you, they will come off our register and we will never re-approach them. We know that the thoroughly professional and moral stance that we have taken has ensured that our clients remain just as loyal as our candidates. Whether you are looking for a junior broker, trainee claims handler, underwriting technician or Main Board Director we will apply exactly the same standards and work just as hard to resolve your problem. It stands to reason that a business as long-established as ours has to be right choice for you, but find out for yourself and speak to your nearest consultant or drop an email explaining the nature of your enquiry to our email address at recruit@iauk.co.uk.